It certainly has been an interesting year for property rentals in the North of Mauritius so far. As expected, most of the prices that are being acheived have dropped. The length on market has also substantially increased albeit only when owners are resistent to adjusting their asking prices. This diagram below perfectly illustrates the effect of CORRECT pricing on the market. 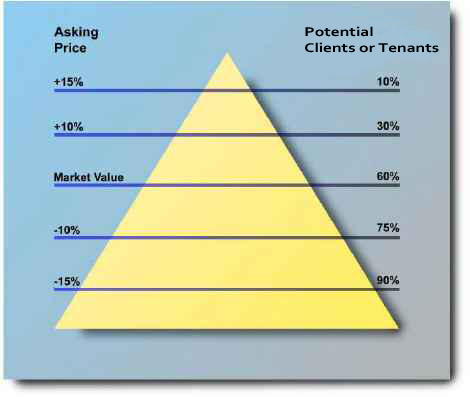 One will notice that the higher the percentage above market value, shown on the left-hand side of the pyramid, the less interest on the right-hand side i.e. potential tenants. Naturally we could add another parameter to this and that would be TIME, the bottom of the pyramid being shortest time spent on market and the top end being longest time on market. Quality and location naturally hold their value, but more so we think the reason the values hold on these particular properties is basically because of the scarcity, there is a real lack of choice when it comes to modern, spacious well built homes for expatriates. Well thats our little (obvious) food for thought this month! If you or someone you know is looking for new home, we would be happy to help. Don’t forget to visit our Facebook Page (click like to stay updated on new properties and news) or visit our website for more Real Estate related news.